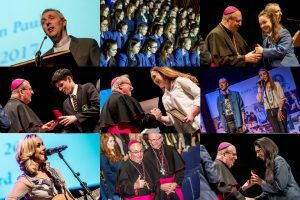 On Tuesday 7, February, 2017 the diocese of Derry held their 10th Annual Pope John Paul II Award ceremony in the Millennium Forum, Derry City. 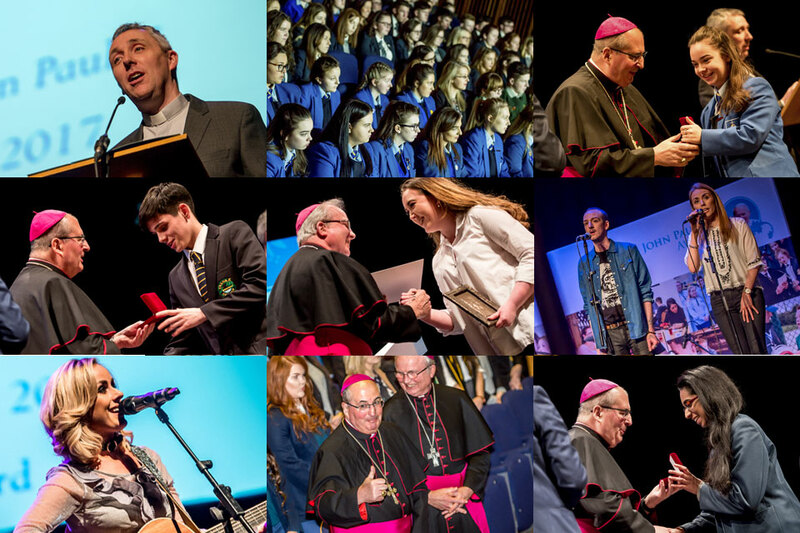 Archbishop Philip Tartaglia, Archbishop of Glasgow, and Bishop Donal McKeown, Bishop of Derry presented the Pope John Paul II Award to 428 young people from all over the diocese of Derry and beyond. These 482 young people came from 21 second level schools representing 49 parishes in the diocese and 16 parishes from outside the diocese. The Award was also presented to young people from Malin Presbyterian Church, Still Waters Elim, and Cornerstone City Church. 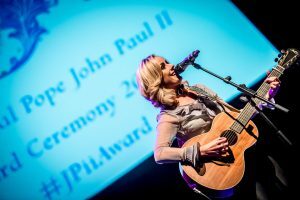 Renowned singer song writer, Niamh McGlinchey who completed her Pope John Paul II Award in 2009 inspired the audience by recounting her experience of the Award and performing ‘If you were Me‘, a song Niamh wrote after hearing Jean Vanier speak at the Derry Diocese Award ceremony that year. The Long Tower folk group also performed with I Am worship band finishing the ceremony off with a lively and uplifting set. Photographs of each school and parish group can be viewed on the Pope John Paul II Award Facebook page or on the Derry Award web site. 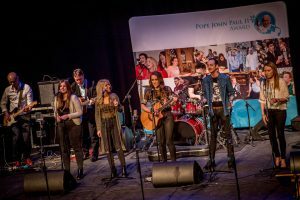 This was the 10th Annual Pope John Paul II Award ceremony in Derry. The Award was launched in Derry in 2006 by the Papal Nuncio at the time Archbishop Lazarotto. It was never imagined that the Award would spread beyond the diocese. 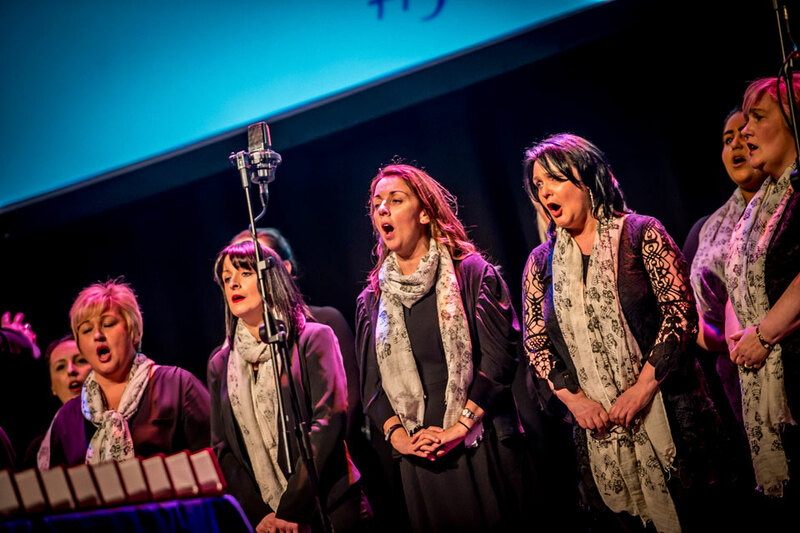 However in the last 10 years the Award has been introduced in 22 dioceses in Ireland and 2 in the UK – the Archdiocese of Birmingham and the Diocese of Hexham and Newcastle. This year an international coordinator has been appointed for the Award, Mr Tony Brennan. In the last ten years about 25,000 young people have enrolled. 3,845 young people have received their Award in the diocese of Derry since the Award began. 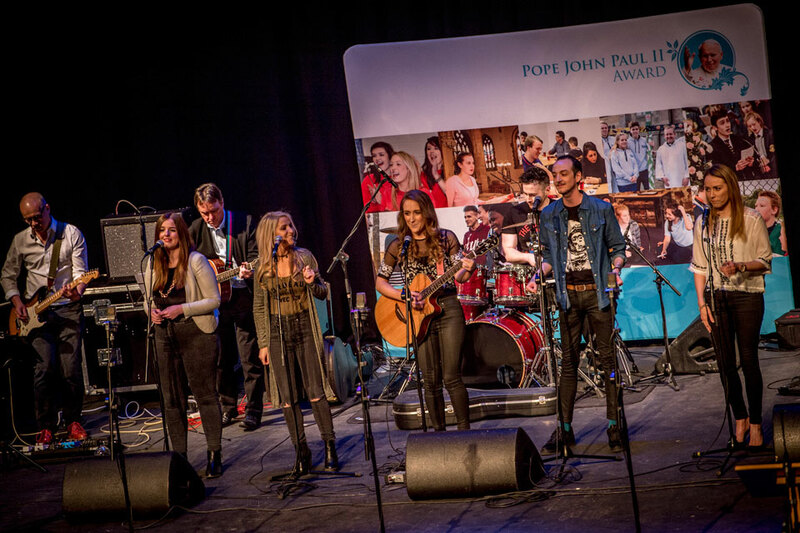 It was recently acknowledged that the Pope John Paul II Award is the largest youth movement in the Church in Ireland. 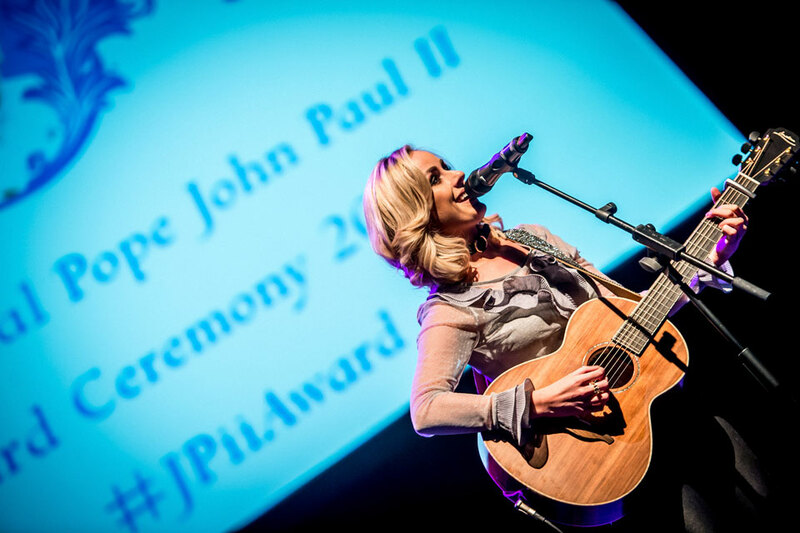 This year, the Pope John Paul II Award is celebrating its 10th anniversary. To mark this special occasion and celebrate the achievements of so many who have achieved the Award, there are 2 important events taking place this year. On Wednesday 5th April there will be a day of celebration at Knock Shrine. We are delighted to be celebrating the Award at Knock which Pope Saint John Paul II visited in 1979. This day of celebration is for people doing the Award at the moment and those who have received their Award over the last ten years. Contact your Award coordinator for more information. At the end of October there will be a Pope John Paul II Award pilgrimage to Rome to celebrate the ten years, the highlight of which will be an audience with the Holy Father, Pope Francis. This pilgrimage is for those aged 18 years and over who are participating or have completed the Award, as well as Award Leaders and Coordinators. Find out more on our events page by clicking here. If you would like to get involved in the Award, please contact the Award coordinator in Derry, Seán Farrell, on 028 7126 4087.